Even when I’m not intentionally shopping for specific pieces, sometimes I come across items that are so unique & so unbelievably affordable that I can’t help myself. This ruffled sweater & coated lace skirt are great examples of styles that are both sophisticated & modern. I can see myself wearing them several different ways – the sweater will be just as pretty with jeans + a camel coat and the skirt will work well in the colder weather with a chunky sweater + opaque tights. With both pieces being under $35, this is further proof that you can look chic on a budget! 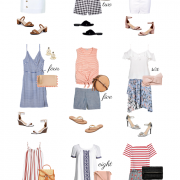 Today only, you can get 40% off one item of your choice at H&M using code 3768 – see more of my top picks from their site here.